Most things cannot be fairly reduced to a number, but numbers are pretty good at telling a general story. WASHINGTON—How many Catholics are there in the United States? What was the total enrollment of Catholic elementary and high schools in the United States last year? How many people are served by Catholic hospitals annually? The answers to these questions (77.7 million, 2 million and 88.5 million, respectively) and many other facts and statistics about the life of the Catholic Church in the United States are compiled in a new guide, “The Catholic Church by the Numbers,” issued by the Office of Media Relations of the U.S. Conference of Catholic Bishops (USCCB). The whole set is here: www.usccb.org/about/media-relations/statistics/. Will look more at it later. The Year of Faith in our Church will soon begin. It is an opportunity for us all to reopen a few treasures that we have too-long neglected, which is particularly strange because they aren’t that old. Two of them, anyway: Vatican II and the Catechism. We will study this year well at St. Meinrad, where Fr. Denis will dedicate his rector’s conferences to this event. Translation: you will hear much more about the year on this blog; his insights are always good to share. This autumn, we will begin the Year of Faith, called by Pope Benedict XVI, the successor of St Peter. We are invited to address three principal themes in this year. First, we will revisit the second Vatican Council which began 50 years ago in 1962, to try to understand it in the context of the whole tradition of the Church. Our Lord said to Peter that he was the rock on which He would build His Church. That is why the successor of St Peter is not just a “religious leader” but the Vicar of Christ on earth. Our Lord told St Peter to confirm his brother apostles in the faith. Pope Benedict continues that work today by affirming the doctrine of the faith: not his own opinions but the teaching of Christ. Since we have such a generous provision from Our Lord that we can know the truth necessary for our salvation, we should take the trouble to be well-informed about our faith, to try to understand it, to make an effort to learn more about it and make it the basis of our lives. Helping the missions surpasses all other works of charity for none are so poor as those who lack the knowledge and the grace of God. Today the words of Pope Pius XI are no less important, but they have a different focus for us. While there is still primary mission work to be done in countries where people have never heard of Christ, there is a far greater mission field in those countries like our own where the Christian faith has been preached, where it has been lived, where it is a major part of our history, and where it has now become forgotten by many, misunderstood, attacked in the media, and rejected by many who have at one time in their lives received the grace of baptism. Bringing the gospel to this mission field is what is meant by the New Evangelisation. Recently a group of priests from a European country [Ed. : Austria] issued a summons to disobedience, and at the same time gave concrete examples of the forms this disobedience might take, even to the point of disregarding definitive decisions of the Church’s Magisterium, such as the question of women’s ordination, for which Blessed Pope John Paul II stated irrevocably that the Church has received no authority from the Lord. Is disobedience a path of renewal for the Church? We would like to believe that the authors of this summons are motivated by concern for the Church, that they are convinced that the slow pace of institutions has to be overcome by drastic measures, in order to open up new paths and to bring the Church up to date. But is disobedience really a way to do this? Do we sense here anything of that configuration to Christ which is the precondition for all true renewal, or do we merely sense a desperate push to do something to change the Church in accordance with one’s own preferences and ideas? Dissent is not the way to real renewal. A good point for us to remember. A couple cool Catholic things going on in Terre Haute. 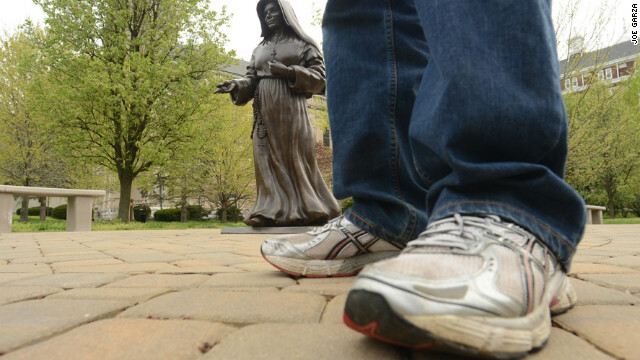 First, Andrew Domini, 19, walked some 90 miles towards a shrine at St-Mary-of-the-Woods after seeing the CNN Presents piece that profiled the Sisters. Perhaps his prayers offered there at the Woods for his friend with cancer will yield another miracle for St. Theodore Guerin. Let’s hope so! Domini is not Catholic but felt summoned to the Woods. There, he said, he found great hospitality and…peace. The story is here. Another piece of news comes from St. Ann’s in Terre Haute, which is all set to close very soon. The parish is donating its altar, baptismal font, pews, tabernacle, candles, vestments and robes to a parish in Kentucky recovering from the destruction that came from a recent tornado. The parish, Sister Connie explained, has been “part of the mission for a time…but now the broader church has to be taken care of.” The parish has served the community and the Church for its life, and now it fittingly will do so even as it closes. Here’s this story. Thanks to the Deacon’s Bench for finding the article that follows. I’ve taken parts of the article for pasting below; you may wish to read the whole thing here. All in all, the article offers good news in terms of our numbers. We are not numbers in God’s eyes, nor are we numbers in the eyes of the Holy Church. But numbers help us to get a general idea of where things stand. We’ll need to do something about the decline in nuns, but I have a hunch the Holy Spirit is working on that, too. You know, it’s an incredible thing to see these numbers. They remind us of the corporate nature of our faith. And they remind us that the powers of Hell will not prevail. Even as parts of our world become more and more secular, the Church grows, and even while one part suffers (e.g., Ireland), another prospers and grows. All things in turn. 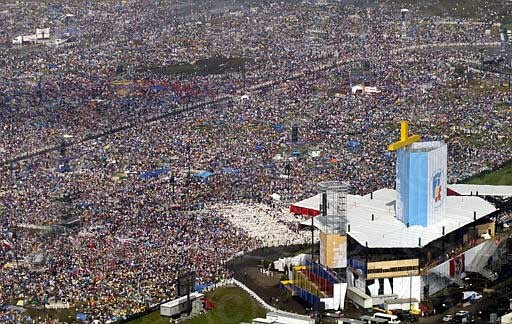 Each of the 1,196,000,000 Catholics in the world’s 2,966 dioceses has been called by the Lord in some way and has been baptized in the name of the Father, Son, and Holy Spirit. And God has designs for each. Each has a unique story. Each is planned. Each is a gift. Each is loved. And each of us is one of them. It is a good thing to be Catholic. The decline that has affected the category of religious seems to have halted somewhat in 2010. In 2009 they counted 54,229 and the number reached 54,665 in 2010. In sharp decline in South America (3.5%) and in North America (0.9%), stationary in Europe, vocations to religious life has increased in Asia (+4.1%), which increase its share of the world total, and Africa (+3.1%). Even the number of professed women religious is undergoing a profound transformation characterized by a strongly decreasing dynamic. Globally, the number dropped from 729,371 in 2009 to 721,935 in 2010. The decline has focused on three continents (Europe, America and Oceania), with significant negative changes (-2.9% in Europe, in Oceania -2.6% and -1.6% in America). In Africa and Asia, however, the increase was very significant, at around 2% for both continents. The number of students of philosophy and theology in diocesan and religious seminaries has steadily increased over the last five years. On the whole, it is up 4%, from 114,439 units in 2005 to 118,990 in 2010. The number of students in the major seminaries is down in Europe (-10.4%) and America (-1.1%), up in Africa (+14.2%), Asia (+13.0%) and Oceania (+ 12.3%). Father Edward Flanagan to be declared a "Servant of God"
I spent last summer in Omaha and was blessed to spend a bit of time at Boys Town. What an awesome place. 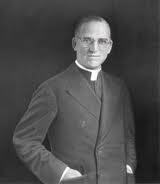 Recently I stumbled across the excellent news that Father Edward Flanagan, the founder Boys Town, will be declared a “Servant of God” next month as the Archdiocese of Omaha opens his cause for beatification. Yesterday saw the ordination and installation of the new bishop of Evansville, Indiana. 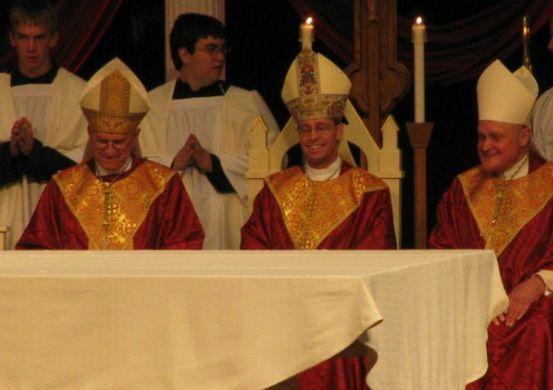 Bishop Charles Thompson comes from the Archdiocese of Louisville, where he had served as Vicar General and pastor for several years. He had just been named rector of the Cathedral when this announcement came through. The ordination was held at Roberts Stadium. 6,000+ folks turned out for it! Bp. Thompson has lots of work to do…let’s pray for him!